Texans in Congress spent Tuesday processing a series of stunning political revelations as President Donald Trump's presidency becomes more embattled. WASHINGTON — Texans in Congress spent Tuesday processing a series of stunning political revelations, as President Donald Trump's presidency becomes more embattled. The issues are plenty: The firing a week ago of FBI Director James Comey amid an ongoing federal investigation into Trump associates' relationships with Russian intelligence, a report that Trump shared highly classified intelligence with Russian officials, and a new report alleging Trump asked Comey to stand down on an investigation of his former top national security aide's ties to the Russian government. Early Tuesday, U.S. Sen. Ted Cruz exhibited concern and caution on Tuesday over a Monday report that stated President Donald Trump had revealed highly classified intelligence to Russian officials. The junior senator from Texas further urged patience amid an increasing firestorm at the U.S. Capitol over the incident. "It is unquestionably important to protect the sources and methods we use to collect intelligence," he told reporters on Tuesday afternoon. "I'm going to wait and withhold judgment on what's been reported until I know the facts and circumstances — of what was said and what the context was." The Washington Post reported on Monday that Trump revealed intelligence involving the Islamic State to the Russian foreign minister and the Russian ambassador to the United States. "And I'm hopeful to learn more details in a classified setting, an appropriate setting to have a briefing and understand what was communicated," Cruz added. "But I don't think we should leap to conclusions based on press reports based on anonymous sources." "The proper way to assess a situation is to do so with facts and evidence and understanding, and I look forward to learning more about what was communicated and what wasn't," Cruz added. 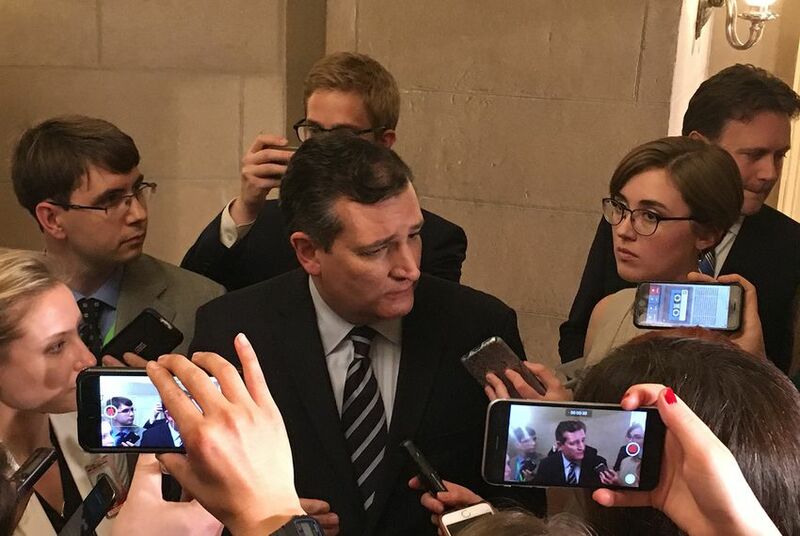 Cruz's office provided a transcript of the comments to The Texas Tribune, which came amid a tense afternoon at the U.S. Capitol. Twice on Tuesday, Senate Majority Leader Mitch McConnell downplayed the controversy, calling it "drama" from the White House. Texas congressional Democrats were enraged with the Post report, which multiple news organizations also confirmed. "If true, first he holds victory party w Russian officials in the Oval Office and then endangers national security by sharing classified info," tweeted U.S. Rep. Joaquin Castro of San Antonio soon after the report surfaced. Later Monday night, U.S. Rep. Sheila Jackson Lee, D-Houston, released a statement saying impeachment ought to be a consideration: “Congress should continue a thorough investigation into this Administration’s activities and let the process lead to wherever it goes — even if it means impeachment." U.S. Rep. Al Green, D-Houston, called for Trump's impeachment on Monday — prior to the report of Trump and the intelligence revelation. He urged for such an outcome in reaction to Trump's abrupt firing of FBI director James Comey, who was investigating Trump associates for possible collusion with Russian intelligence officials. U.S. Rep. Lamar Smith, R-San Antonio, questioned the validity of the Post's report. Most members of the House delegation were otherwise mostly quiet on the matter dominating the Capitol as of Tuesday afternoon, ahead of their reconvening that evening following a week-long recess. By the time the House returned to the Capitol for the first votes in the week, a new bombshell broke: The New York Times reported that Trump allegedly asked Comey to stand down on his investigation of former National Security Adviser Michael Flynn's ties to Russia. The news broke as several members of the Texas delegation were in a House Intelligence Committee briefing. After exiting that meeting, U.S. Rep. Mike Conaway, R-Midland, repeatedly said he had no comment to an array of questions about the various scandals. But Conaway is the newly installed leader of the investigation into Trump's alleged Russian ties, and one of his few comments was to promise a""bipartisan ... thorough, meticulous" investigation. Castro, the lone Texas Democrat serving on an intelligence committee and a lawyer, released a statement describing Trump's alleged actions as using his "office to obstruct justice." Once the House began to vote in early evening, members expressed private disbelief over events in the last week. Many were unaware of the latest report and were reluctant to comment. U.S. Rep. Randy Weber, R-Friendswood, said he needed to catch up on the news after spending the week vacationing with his grandchildren. U.S. Rep. Filemon Vela, D-Brownsville, suggested impeachment was a possibility if the New York Times report proves true. "We're getting close to a point where we need to start thinking about impeachment," Vela said. Impeachment proceedings start in the House, and there is no sign that House Republicans will turn on their president. What happens if they choose not to pursue such avenues? U.S. Sen. John Cornyn pulled out of consideration for the position of FBI director. Republicans mostly refused to comment on whether a Congressional investigation is sufficient to getting to the bottom of Russian interference in the 2016 election. Both Cornyn and Cruz recently defended the firing of former FBI Director James Comey.